The Magnet Array is a scientific experiment that collects dust on the Mars Exploration Rovers, Spirit and Opportunity. Magnetic grains in Martian dust are tiny pieces of the Red Planet's past. The Magnetic Array collects the dust for analysis by scientific tools that identify the composition and present clues on the history of the dust particles. MAIN JOB:To collect airborne dust for analysis by the science instruments. LOCATION:Seven magnets on each rover: Four magnets are carried by the Rock Abrasion Tool (RAT); two magnets (one capture magnet and one filter magnet) are mounted on the front of the rover; another magnet (sweep magnet) is mounted on the top of the rover deck in view of the Pancam. SIZE:The RAT carries four magnets that are 0.27 inch (7 millimeters) in diameter and 0.35 inch (9 millimeters) thick. The two magnets on the front of the rover are each ~1 inch (25 millimeters) in diameter. The magnet on the rover deck is 0.35 inch (9 millimeters) in diameter. MAGNET PURPOSES: Capture Magnet: Designed to be as strong as possible to make it capture any magnetic particle within range. Filter Magnet: Designed to capture primarily the most magnetic particles. Sweep Magnet: Designed in a way that only allows non-magnetic particles to settle in the center of the magnet. Mars is a dusty place and some of that dust is highly magnetic. Magnetic minerals carried in dust grains may be freeze-dried remnants of the planet's watery past. A periodic examination of these particles and their patterns of accumulation on magnets of varying strength can reveal clues about their mineralogy and the planet's geologic history. Each rover has three sets of magnetic targets that will collect airborne dust for analysis by the science instruments. One set of magnets is carried by the Rock Abrasion Tool (RAT). As the RAT grinds into martian rocks, scientists have the opportunity to study the properties of dust from these outer rock surfaces. A second set of two magnets is mounted on the front of the rover at an angle so that non-magnetic particles will tend to fall off. 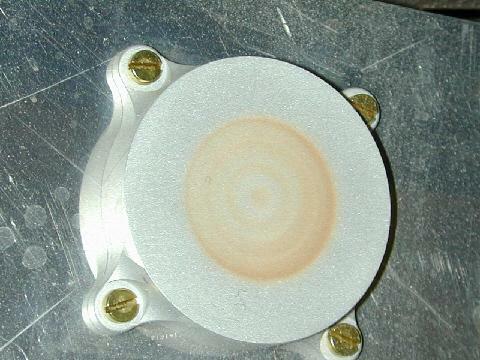 These magnets are reachable for analysis by the Mössbauer and APXS instruments. A third magnet is mounted on the top of the rover deck in view of the Pancam. This magnet is strong enough to deflect the paths of wind-carried, magnetic dust.